Potato planters, grow bags and raised beds are used to grow prize winning potatoes for the garden show bench. They provide the earliest new potatoes. Growing potatoes on my concrete yard. 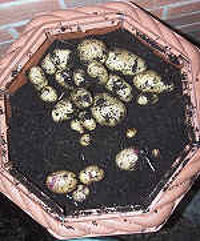 of my potato barrel crop. BOTTOM OF THE POTATO BARREL SLIDES UP. "Red Duke of York" grows well in containers. The plastic sheet was used merely to contain the soil. Fill your tub with compost as they grow. Note: 4 or 5 plants will fit in one of these tubs. 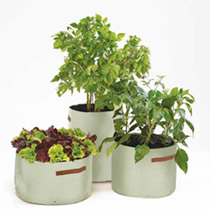 Wrap around potato tubs, potato barrels, and bags, all fit coveniently and neatly on hard surfaces that are open to full light. Try them on your patio, in your back yard, or even on a balcony. They give you a convenient way to harvest your own fresh spuds. Below you'll discover how you can grow the earliest potatoes for summer salads as well as freshly picked 'new' potatoes to roast and eat for Christmas dinner. Grow potatoes for longer in the fall and harvest them fresh for Christmas. Buy 'First Early' seed potatoes - 'Swift' and 'Rocket' (U.K.) are the fastest to produce - but 'Nicola' is perhaps the nicest to eat. A compact growing variety is best. 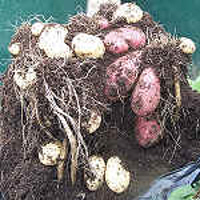 Begin chitting them in late December early January, see links below on how to chit potatoes. get a few bags of potato growing compost available from the links below. 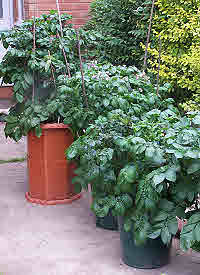 You can leave your potato planters in a conservatory or cold greenhouse. 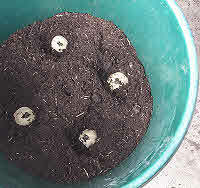 They'll be growing before garden potatoes are planted outside. When the frosts are over the tubs get moved outside - before they are too full and heavy. Results:- You'll get the first new potatoes of the season in early summer. And a clean crop suitable for the show bench. 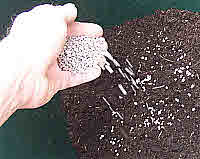 Note:- you can mix proprietary compost with your own made garden compost to make it go further and better. My first specialised potato planter was the 80 Litre Potato Growing Barrel. It's made of a flexible corrugated material with stiff sides that fold flat when not in use. The sides pull up to give direct access to the potatoes growing near the bottom. It looks attractive on the patio but a little harder to move around. MOST IMPORTANT: give your potatoes a moisture holding compost and keep them well-watered and regularly fed with high potash potato or tomato liquid feeds as they are growing. 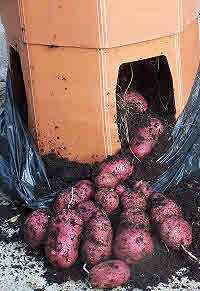 Fill your potato planter or potato growing bag to about 4-5 inches deep with your compost. Now it's important to keep the compost in potato planters adequately watered, especially in dry spells - check them regularly (indeed every day). Your potato plants may need staking up to support them if you didn't choose a compact growing variety. By using rich compost, liquid feeds and adequate watering you can produce prize winning potato tubers unscathed by pests and disease. But specially prepared late potatoes are available to buy from summer. When the leaves die down you can cut the haulms away for composting. Your potatoes will store nicely in the container compost even outside until you need them. Start them inside and bring them outside when the frosty nights have finished and vice versa in the autumn to prolong the growing season. Even small 12inch containers will fill-up small gaps in your potato crop. 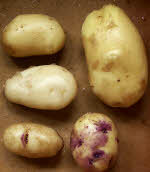 But for the smaller cropping early potatoes the flexibility of the potato bags, tubs and bins, is outstanding. 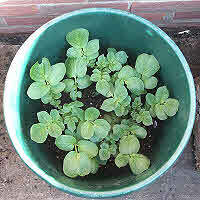 Here again are the links to potato buckets and growing bags, and potato growing compost. A Survivalist explains how to harvest potatoes. But only 6 tubers per plant. Avoid growing long & short season spuds in the same row.